Ladies and gentlemen, today, we see that bastion of greasiness, ancestral breakfast home of dozens of hung-over hipsters the Barskdale Restaurant face off against midtown-ish late night favorite Republic Coffee. In this corner, the Barksdale Restaurant. 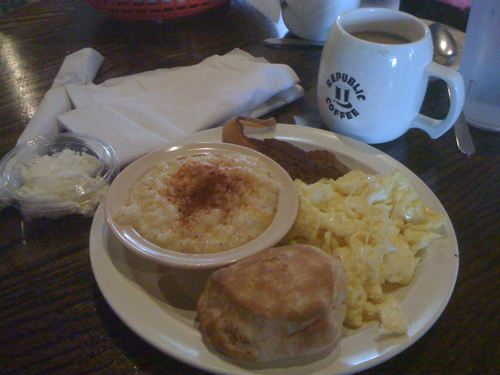 The Barksdale Restaurant, Memphis, Tenn.
Order: Two eggs scrambled, grits, bacon, biscuits, one pancake, coffee, a small OJ. Order: coffee, the Tupelo breakfast (scrambled eggs, biscuit, grits, bacon). They didn’t have pancakes. 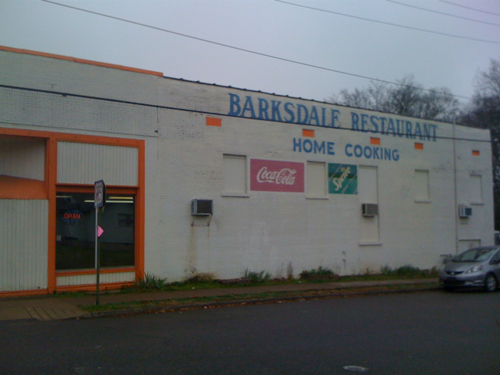 Winner: The Barksdale Restaurant will go on to compete in round two. 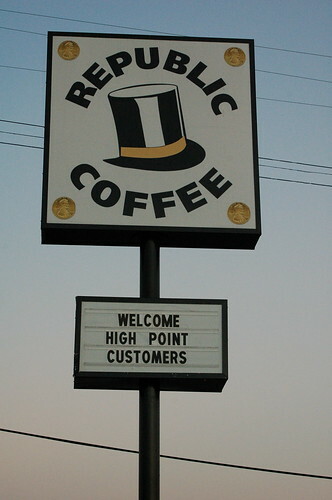 I should have been more clear in my wording – the coffee tasted like it was instant. I’ve clarified the wording in the post. As for the price, I had no problem with it – I felt like it was fair. The Republic coffee mug is really cute! Please tell me it was not plastic. I have no idea where that place is, never heard of it, I don’t think. You’ll probably tell me and then I’ll recall that I drive by it all the time or something. LOL How many places could be called the “bastion of greasiness” and yet, you’d still want to eat there! Love it. @mary – i’m pretty sure that the mugs at republic are plastic, but they’re made from recycled material. took me a while to get used to them, but as part of their attempts to make environmentally conscious choices, i applaud them. and personally, i wish more of these coffee houses had omelets – and all the time, too! @mary, the mugs at Republic Coffee are made of a bio-degradeable corn polymer. Looks and feels like plastic, but can be composted. If not composted (that is, sent to a landfill), they will eventually biodegrade, unlike regular plastic.